Notes: Scarce official cover even with single stamp. The above Royal Mail Village Churches stamps were issued on 21 June 1972 by Royal Mail and feature the following stamp designs: 3p Greensted; 4p Earls Barton; 5p Letheringsett; 7 1/2p Helpringham; 9p Huish Episcopi. 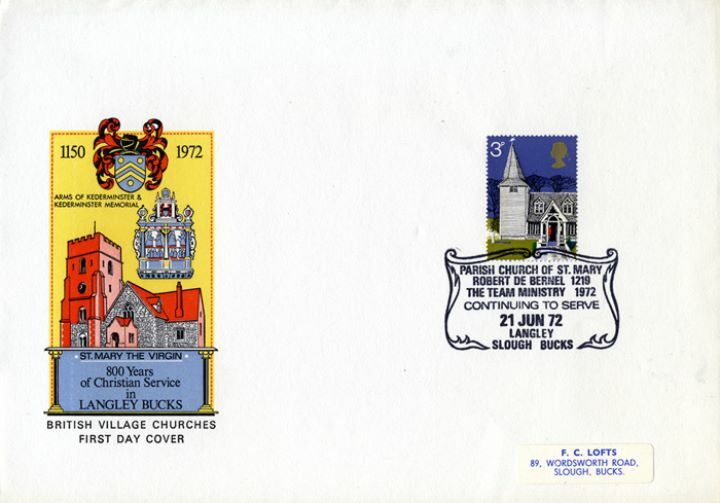 The St Mary the Virgin first day cover with the Langley Slough, Parish Church of St. Mary - Robert de Bernel, Special Handstamp postmark has been produced by Official Sponsors and features these stamps which can make a very collectible and lovely gift.